We have access to the complete line of feeds and would be happy to carry one that you may like to feed. Please call on availability of product. 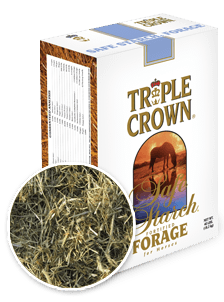 Triple Crown Lite is ideal for “easy keepers” – horses that maintain their weight on very little grain or just on grass and hay. Normally, a horse would have to eat five to six pounds of grain to derive a sufficient amount and a proper balance of vitamins and minerals. This is especially true of growing horses, broodmares, stallions and working horses. 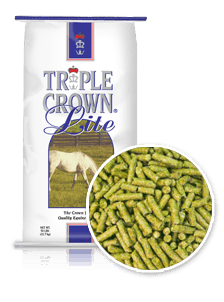 Triple Crown Lite is so heavily fortified, you can feed a horse as few as two pounds per day. This formula is also ideal for ponies and miniature horses. 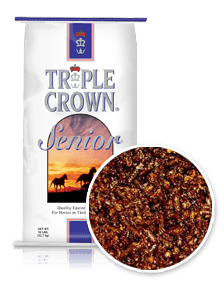 Update: Triple Crown 30% Supplement has a NEW Look and NEW name, still the same formula. 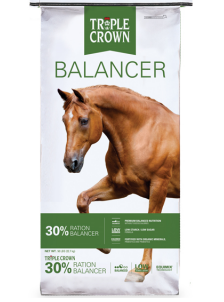 30% Ration Balancer is designed to provide the right amount of vitamins, minerals and nutrients found in Triple Crown Nutrition’s EquiMix. The amount of calories is minimal, but the concentration of other nutrients is high. We recommend this feed for insulin resistant horses as well as any horse requiring a vitamin supplement in addition to their current feed. Great for growing horses and broodmares as well as those performance horses who need quality protein. 1. They only get hay in small batches – so even if the hay is tested, by the time they have the results the hay has changed and so has the NSC%. 2. They get the hay tested and it comes back high in NSC but it is their only supply option. 3. They board so they have no control over the hay source their horse receives.